Hives, part 2: a “simple” matter of swelling? So, in the last post I asked the question, what might be happening when our immune system has been “over-triggered” by a pathogen or allergen, that could then lead to the formation of a hive? Well, we talked previously about how the blood vessels were like pipelines that deliver things to and take things from various places in our bodies. When our immune system is over-triggered, a rush of cells and fluid are piped over to the site of the trigger. 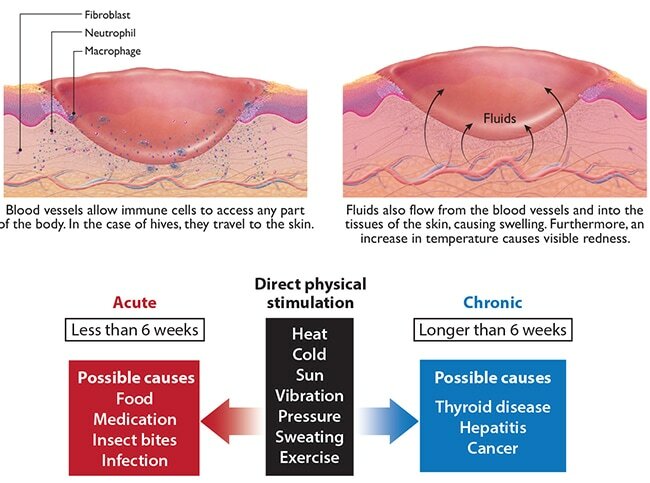 If you look first at the two illustrations depicting what is happening in wound healing, you see a scenario similar to what is happening in the case of hives. It is also accompanied by a rise in body temperature, which is sometimes enough to kill some of the pathogens that triggered our immune response. But then why do hives spread all over the body, or cover vast regions of the body, where the initial irritation did NOT occur? It is a question that the medical and research community still haven’t solved. But in principle, this swelling results from the rush of immune cells and fluid out of the pipeline and into the region to start the process of healing. And as we mentioned in our introduction, the immune system can be over-triggered. When you look at the bottom graphic, you’ll see that a hives outbreak can be classified into two categories: acute and chronic. Possible causes are in the red and blue boxes, but what’s in the black box is what’s of most concern to folks like me who have had a massive hives reaction. The reason is because this list is full of ordinary, everyday triggers, such that it can lead one to a state of paranoia over anything and everything! So in the next post, we’ll continue to talk about the mysteries of hives, treatment, and a philosophical approach to living in the specter of a future hives outbreak. Thank you so much for your patience with me as I have been pre-occupied with the production process of my children’s book! I am making great progress and hope to be back on a regular basis sometime in June. Prior to talking about how the itching sensation that hives can cause has been linked to a particular neural pathway, I said I was going to step back at some point and address how and why hives form, since I had conveniently skipped over that part. So I am rebooting this series of posts to address these important questions that those who have had hives want desperately answered. Hives are such a mysterious occurrence, though, that any one individual may never understand why they happened to him/her in particular. This graphic is a diagram of the cross-section of the skin. What you need to know is that there are many layers of the skin, and through them all, blood vessels are found. Blood vessels are the highways through which nutrients and other vital molecules travel to reach organs and tissues throughout our body. What may not be obvious is that the skin is an organ; in fact, it’s our largest organ, and it too, needs nourishment, it needs to communicate with the brain, and it needs to repair itself and dispose waste. That’s where the blood vessels come in. We can think of blood vessels as pipes, and in general they are impervious tubing that keep blood from spilling everywhere. For the larger vessels in our body, this is imperviousness holds true. But then how do molecules trying to reach the tissues or organs get from the vessel to the tissue or organ? This is where blood vessels get really interesting, because theya re not all alike in structure! The largest vessels start out as multi-layered tubing, with two rings of musculature that can dilate or contract them. As they get smaller and smaller, in order to reach all the minute places in our body, they lose these muscle layers. What’s more, the cells that normally line the tubing and help to maintain their characteristic of imperviousness, actually change to a swiss-cheese type cell. These gaps in the cells’ architecture allow the miniscule molecules and chemicals to leave the vessel and go to the organ or tissue, as well as allow molecules from those tissues or organs to get back into the vessel and travel elsewhere. Hi everyone, I apologize that I didn't get this out for my usual Thursday posts. Many of you may know that I have written and illustrated a children's picture book, "Centipede Dragon A Benevolent Creature." In order to push through the final stages of production on book 2 in the Centipede Dragon series, I fear I must take a break from posting. Coming on the heels of the start on a new topic series on itch and hives, I feel rather bad for this hiatus, and so soon after my last couple of absences. However, once I get through this, I'll be back! Furthermore, don't count me out entirely during this period as I may find interesting things to post about in the meantime. I hope to be back with you soon and will post brief updates on my progress with book production! How many of you have experienced an itching sensation that simply won’t go away until you scratch it? Well, what if after the scratching, that itch sensation comes back minutes later? What if this is happening all over your body, on the palms of your hands, behind the top part of your ear where it meets your head, in between your toes, and in your armpits? In fact, it’s so continuous that once you stop scratching one region, you move to another, and then another, until every minute you are stopping what you are doing to scratch. What if you scratch to the point that you begin to bloody those patches of skin? These are the experiences that made me want to focus on the itch factor, which is actually a little known phenomenon as to what exact purpose it serves and how, when only 5% of all your sensory nerves have the ability to send the “itch” signal to the brain, it can really cause a disruptiveness and destructiveness in a person who is experiencing such insatiable itch. So, let’s start out with the basic physiology. An irritant of some sort can get into your body in many ways. The obvious one is eating. But it can also get through your skin cells through these little channels found in every cell’s walls. Like doors where some go in or out, or some that lead into restaurants while others lead to bakeries, these channels in and out of the cell are equally as diverse, while also being multipurpose (i.e., going in AND out of a restaurant, or leading into both restaurant and bakery). One in particular is called the TRPV1, but unless you’re an itchy-causing substance, you’re not going to get through this door (1). If you ARE an itchy irritant, then not only do you get into the cell, but now you can gain access to a nerve ending. Furthermore, you’ll be able to stimulate a C-fiber, a class of neuron that can produce NppB, or natriuretic polypeptide b (2), THE itch neurotransmitter. And this is where the tortuous itching begins. Using a dedicated circuit, or route, to the brain (3,4) via the spinal cord, along with a possible intermediary neurotransmitter (5), the firing neuron sends the message to your brain that says “ITCH!” (6). Let’s make up lost time this week with an "extra" post beginning a new series, inspired by my own recent experiences with an incredibly annoying and all-consuming sensation: Itch. I recently experienced a very severe hives reaction. On the morning of the massive attack, I woke up feeling like I had an elephant sitting on my chest; it felt laborious to take in a good, deep breath. As the day went on, I started feeling a little better. Someone at work brought in a cake, and so I took a slice for after my lunch of a peanut butter sandwich on wheat, yogurt, and apple. The rest of the day concluded; I went to the gym and did my usual workout. I went home, and ate leftovers for dinner. During the day, I had noticed a couple of raised, non-red bumps on my leg. I didn’t think anything of it until I scratched at them, and promptly forgot. But as the evening wore on, I noticed some bumps coming up on my face. Now, I have eczema, as you all know, and all this was coinciding with a swell of warm weather and subsequent huge spike of tree pollen. So in walking around in this pollen-filled air, it didn’t surprise me that I would be experiencing a topical reaction. In fact, I attributed the breathing issues with the inhalation of tree pollen. I went to bed, and through the night, I started feeling prickles all over my body. Very subtle, but noticeable enough to wake me. I also noticed some prickles were more pronounced in my right armpit and my left ear, and kept waking up in the process of scratching them. At 1:30, 3:00 and 6:15 am I took Benadryl. And my left ear was indeed by then quite swollen. When I awoke in the morning, I made my coffee, and then went to the bathroom to check out my ear in the mirror. The left side of my face was covered in red spots. According to the docs, this hives reaction was not a topical one. It was definitely something I ate. And while I wait for the blood test results that are testing for the common food allergies (Peanuts/nuts, shellfish, eggs, gluten), I’ll say that when something like this happens to you, be very OVER reactive when it comes to treatment, because when swelling involves your face, it can involve your windpipe, and you could end up not being able to breathe. So, although this was a serious incident for which I must now carry an Epipen and an inhaler, I wanted to spotlight the itching that subsequently comes with hives. It seems as if there are other more serious aspects of this medical issue on which I should focus, but itch is a very mysterious, and persistent sensation, that can frankly be quite disruptive to life. So, we’ll go on this journey together, and double back to talk about hives, more specifically, how and why they form. Hello all. I was going to start a series of posts on strokes, but then got derailed myself with the hugest hives reaction I have ever experienced. Needless to say, not only did I get put off from being able to work on the stroke posts, but I started working up some posts on a pesky side effect of hives, and that is itching. So bear with me as I work through these two series, I will keep you posted as to my progress! To conclude our cancer vaccine story, we are going to take a closer look at the multi-tasking abilities of the B cell. In the last post, we covered how the B cell has the ability to transform into a killer T cell (which is pretty COOL) that can take care of the very invading foreign particle which first stimulated it into action. Furthermore, the B cell is also capable of transforming into another type of cell, called the plasma cell. This is actually an extremely important aspect of our immune system, and that is, the ability to catalog what has been encountered in order to recognize and quickly destroy the foreign particles the next time it invades our bodies. And because it already has the recognition part down, it works far faster and much more powerfully to neutralize that threat. So in the graphic, some of the B cells will go in the direction of arrow 4, while a smaller fraction will go the way of arrow 6. These transformed B cells become plasma cells, which serve as the filing cabinets of the immune system that are coupled with a powerful search engine. So, if that foreign particle once again gets into our bodies, the plasma cells rapidly (and I mean rapidly) identify the invader as “bad” and signals the T cells to attack and destroy. It is a truly, amazing defense system. And thanks to scientific research, we have folks dedicated to figuring out how to stimulate and fine tune our natural defense system to work more effectively for us. I love having this post as a forum to share important information about science, medicine, and health. And so, to help me cope with an event of this past December, I’m sharing with you a simple test that everyone should know and is easy to perform. My niece knew it, and for that she was able to save a life. This test is called FAST, and it’s an acronym for F-ace, A-rm, S-peech, and T-ime. This simple test is what you perform on someone when you suspect they are having a stroke. But to back up, let’s quickly review what a stroke is, and what symptoms would clue you off to someone experiencing a stroke. First, a stroke describes what happens when the brain has been oxygen-deprived, and tissue damage has begun to occur. Once tissue damage becomes significant, a myriad of problems can occur: speech becomes slurred, incomprehensible (words aren't pronounced properly) or doesn’t make sense (words jumbled together), the person becomes unresponsive to questions, eyes cannot track movement or the person reports distorted vision, odd repetitive movements of the head occur, lack of mobility in the body (like the arms) happens, and even visible changes in facial structure (a drooping corner of the mouth, or a whole side of a face is slack) are seen. Oxygen deprivation can also occur in many ways. The most familiar one is that a clot has broken off from the wall of an artery (vessel that carries oxygen-rich blood from the heart to the rest of the body) from where it formed, traveled through the heart, the lungs, and finally lodges in a smaller vessel that leads to the brain. From there, it cuts off the oxygen-rich blood to the brain, and that is how the brain tissue starts to get damaged. A lesser known cause is that a vessel that drains the oxygen-depleted blood, called a vein (vessel that brings blood back to the heart for oxygenation), can get clogged by a clot as well. This occurrence is actually extremely rare, and so although the brain is able to receive oxygen-rich blood, the oxygen-depleted blood cannot drain away. And when it has nowhere to go, it floods the brain tissue, which, if you can imagine, is somewhat akin to the tissue getting drowned in excess fluid. Thus the same thing results: the tissue starts to get damaged. If the person fails these tests, CALL 9-1-1 ASAP. Don’t hesitate, because the more time the brain tissue is damaged, the less of a chance it has to undo the damage and recover. Because it can, and it will, if we act FAST. I'm so sorry, I'm late in posting this one which should have gone out January 26! So, here we are, with our final discussion of cancer vaccines, which was the 3rd approach in immunotherapy after checkpoint blockade and CAR T cell. Last post we talked about how a certain type of cancer vaccine wasn’t really a “vaccine” in the true definition of providing protection AGAINST a certain disease. Rather, it was helping to prevent further spread of disease, and in some cases, even treating or fighting the disease. In this post, we’ll discuss how a cancer vaccine does function to help our own immune system fight against acquisition of disease: in this case, we’ll look at the HPV vaccine, which protects us from cancers caused by the Human Papilloma virus. The technological approach uses the same theory we have been employing for decades. We modify the actual virus in some way as to make it unable to replicate and spread throughout our body. But we don’t modify that virus to the point that it doesn’t look like itself anymore. In the graphic above, it is the lighter green version of the virus labeled “HPV vaccine,” that has had its gene altered in a way that prevents it from replicating (dark green portion of pink gene). This modified version of the HPV is then introduced into our system (1) . As it is a foreign substance, an antigen presenting cell (APC) scaven ging the blood encounters this modified virus and processes a piece of it to then present it to a helper T cell (2). The helper T cell then signals the B cell (3) to then turn into activated killer T cells that will take care of the foreign HPV particles (4, 5). Regardless of whether or not the vaccine viruses cause disease is actually irrelevant to the killer T cell. Now, that process takes care of the modified HPV particles that have been introduced to our bodies in the form of the vaccine. But later, if HPV once again gets into our bodies, what do you think will happen at step 6? Answer, next post! Now, what were we talking about? Thanks once again for your understanding with this long and unexpected absence. Happy new year! I hope you are having a good start to the new year. As for me, what better way to launch into our timely topic series on immunotherapy, than with a trip down memory lane? The image you see above is something I did for Scientific American way back in 2004, when cancer vaccines were something so unprecedented and seemingly decades away. Well, here we are, 17 years later, talking about this very same drug depicted above, for use against prostate cancer: Provenge® by Dendreon, the only FDA-approved cancer vaccine for prostate cancer. This prostate vaccine is really a stimulant for the immune system to mount a better defense against cancer cells. Thus, it's not preventing disease, rather, it is trying to treat existing disease. A cancer vaccine is made by first taking either the body’s immune cells that have been exposed to the cancer, or pieces of the immune cell, or even pieces of the cancer cell out of the body, and then exposing to chemicals (1) to create the vaccine. In this image, a tumor antigen (orange/yellow piece attached at the right end of the chain of balls) certain chemicals created in the lab (1) can turn those cells into a special type of cell called a dendritic cell (2 through 4). Fully mature dendritic cells are useful because they migrate to the location in the body (e.g., lymph nodes) where T cells are ready to identify what they are presenting (5). This is therefore a way to prime the immune system to recognize tumor cells (6) in a more targeted way. In the next post, we will explore the the HPV vaccine, a more “traditional” style of vaccine. The purpose of this blog is to explore more effective and exciting ways to communicate science.